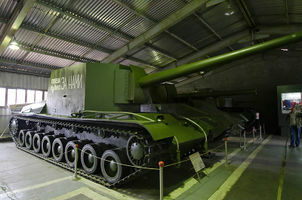 The SU-100Y was a Soviet prototype self-propelled gun, developed from the prototype T-100 tank. It was developed during the Winter War with Finland to include a 152 mm gun to destroy concrete defensive structures like bunkers and anti-tank obstacles. It did not see service before the end of the war but was brought into use in the Second World War in defense of Moscow. This page was last modified on 19 December 2015, at 00:11.